Work-Life balance is a myth. It is often portrayed as a scale, with one side for home and the other for work. Each side of the scale in perfect balance. I don’t know a single woman who feels she has work-life balance. Many people think of work and life as competing for our time. In this view, work often wins at the cost of our personal and family time. The technology has made work and your personal life interconnected. The days of leaving work at the office at 5 o’clock, are long behind us. We can access our work and emails from anywhere, often just by glancing at our phone. Sometimes we work at home, in the grocery store, and at the soccer field. The idea of work-life balance – 50% of our time devoted to work and 50% devoted to our personal life – is a myth. Yet many of us, beat ourselves up, for not being able to achieve it. We need to start treating it as a myth and stop being so hard on ourselves when we can’t achieve it. 1. Accept that you will not have work-life balance, but strive for effective work-life integration. Determine what the right mix is for you on any given day – how many hours will you spend on work and how many hours will you spend on other things. Then base that mix on your priorities for that day. 2. Be clear on what your priorities are and use that as the foundation for how you manage your time. The day will get away from you if you let it. If you focus on what is important, you use your time more effectively. 3. Be present on what you are doing and make the time, quality time. If you are playing with your child or watching their soccer game, be fully present. Don’t check your email or social media. If you are working on a project at work, stop getting interrupted by new texts or Facebook messages. Multitasking doesn’t really exist. If you are fully present, you not only will get more done, but you will enjoy it more, too. 4. You must say “no”. Everything competes for your time and energy. You have to say “no” at times. Being clear on your priorities will help you determine what you can and when you should say “no”. It doesn’t have to be perfect. Forgive yourself when it’s not perfect, and stop feeling guilty. Ask for help, when you need it. Even Wonder Woman doesn’t do it all, alone. Remember, it is not about achieving some perfect balance. Instead it about being happy with the choices we make, regarding how we spend our time. 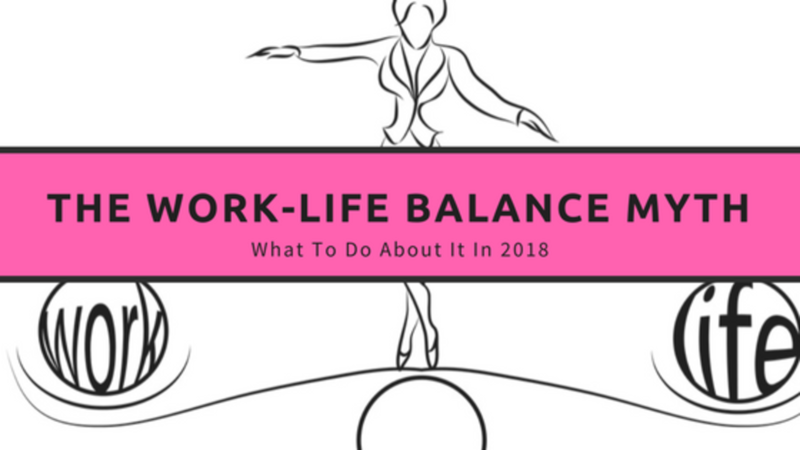 In 2018, stop feeling bad about work-life balance and start choosing a work-life integration you are happy with!